Happy Wednesday everyone! 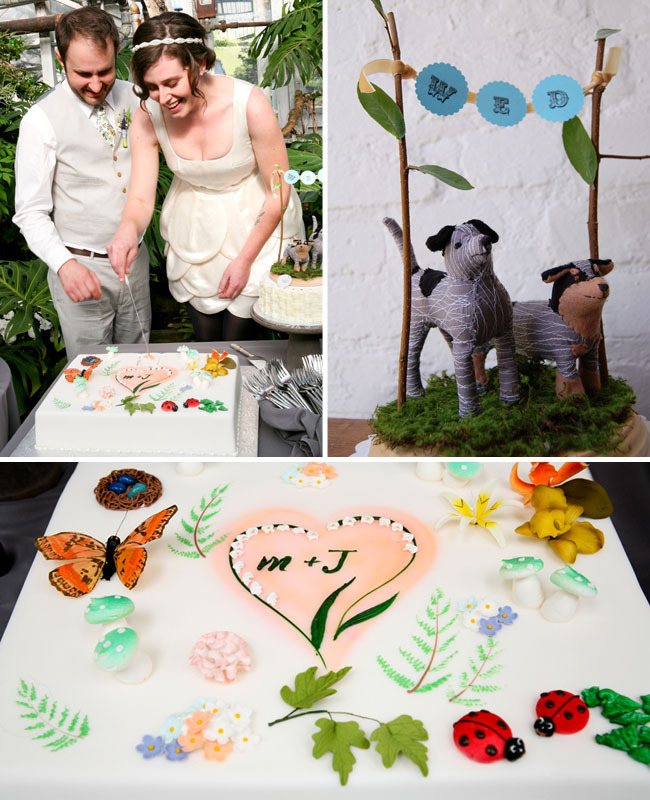 If you read design*sponge, you may have already seen this wedding featured there, but it’s so fun + creative that I asked Jill to share it with us today. 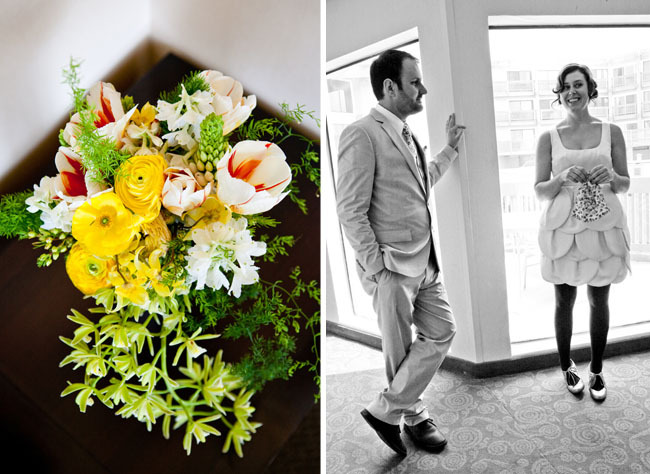 Jill is one of the owners + creators of the beautiful floral designs from Studio Choo in Northern California. I’m a huge fan of their work, so I’m super excited to share her wedding today. Jill was also sweet enough to send over some great advice and details into her day. From Jill: The inspiration for the day was really the location. I had so many ideas for so many different wedding scenarios (we thought about a secluded lake, horse barn, backyard, and the beach! ), but when we found the greenhouse we knew it was just right. It was playful and quirky, already covered with natural decorations (so I didn’t have to stress too much about the flowers), and was close to our home and hotels for easy travel planning. From there it was a lot of editing and figuring out what would make sense for the space, while still including lots of details that were meaningful to us. The night before the wedding my “we like it wild” girls (Lia the bridesmaid and new cousin-in-law, Alethea the maid of honor and best friend) and I stayed in a hotel room together. We cracked a bottle of wine, wound down after the “rehearsal dinner” celebration, and started making our bouquets and the boutonnieres. 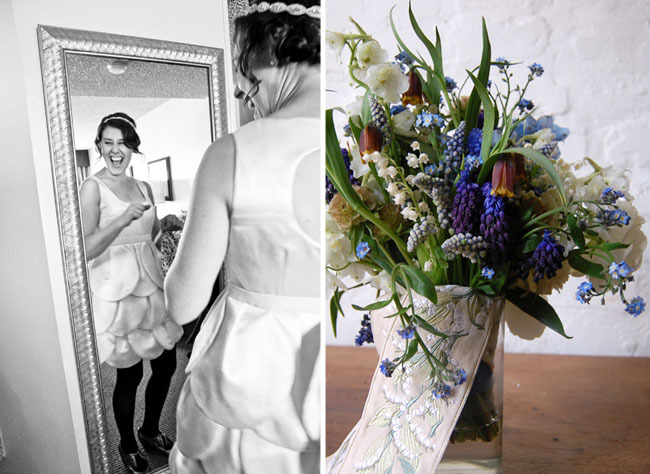 My flowers were a mix of all my tiny favorites; lily of the valley, muscari, forget-me-nots, fritillaria, and ranunculus tied off with a vintage lily of the valley ribbon. 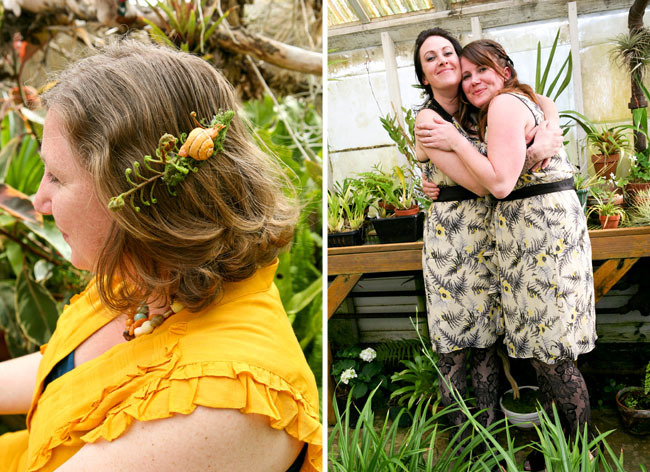 The girls had big, wild, yellow and white bouquets with trout lily, ferns, ranunculus, giant dubium and fritillaria, tulips, and orchids. I was lucky enough to have an amazing friend-of-a-friend designer create my petal dress, and seeing the process from sketch/to muslin/to the real dress come alive was such a cool experience. 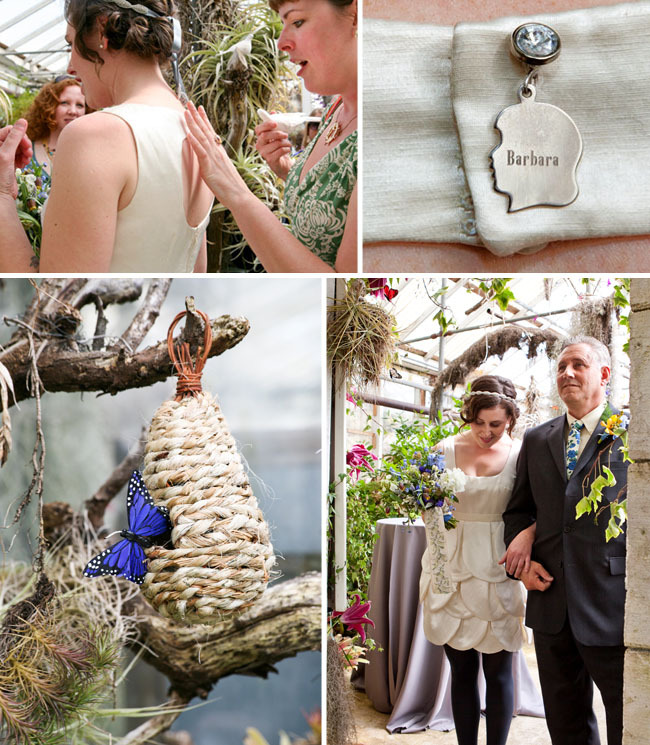 My favorite detail was a profile charm with my mom’s name on it (that belonged to my grandmother) that I asked the designer to put on the back of the dress. My mom passed away when I was fifteen and my grandmother a few years later so it was really special to have a little visible memory of them both with me that day. Since I got to have a dress made just for me, I wanted to give the guys in the wedding party a personalized piece of their outfit too. Alethea and I visited Britex to pick out a few fabrics, and I enlisted the help of two very talented ladies to do the rest. Jenny (who also makes beautiful baby blankets and aprons) expertly whipped up six beautiful ties and Alexa (filmmaker and Little Otsu button queen) skillfully embroidered my requested names. 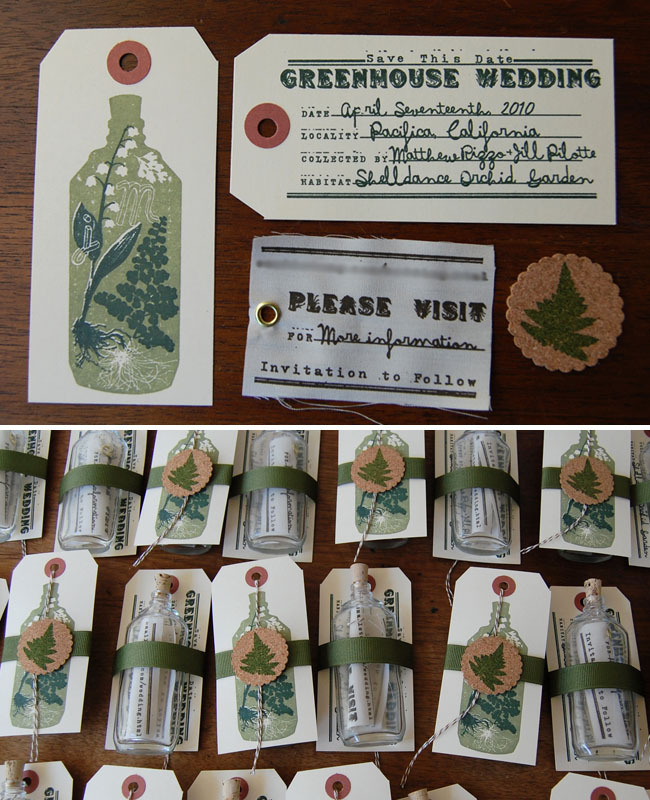 I designed our save the dates to look like botanical specimen tags and give some clues on the type of location we had chosen. There was a small bottle with a secret message inside that gave our wedding website so out of town guests could plan early. Matt and I gocco’d, punched, ribbonned, tied, and glued for a few weeks! We were so happy with the way the whole package turned out. We made boutonnieres, corsages, and hair pins out of assorted silk flowers and vintage fixings (in the weeks leading up to the wedding) and set them out along with fresh blossoms for the guests to put on as they entered the greenhouse. It was so fun to see what each person chose and how they wore it. What was your favorite memory? There were so many amazing happenings and memories that day with my family and friends like getting ready with my girls in the morning, seeing Matt for the first time in his suit, and walking down the aisle with my dad. I think my fondest memory of the day though was just a feeling of overwhelming happiness. I was kind of amazed at how blissful I felt- I don’t think I have ever smiled and laughed so much in my life. For our favors we wanted to include a little gift that had a part from each of us. I love gardening and Matt loves pickle making so we included his simple pickle recipe and seeds for the main ingredients. 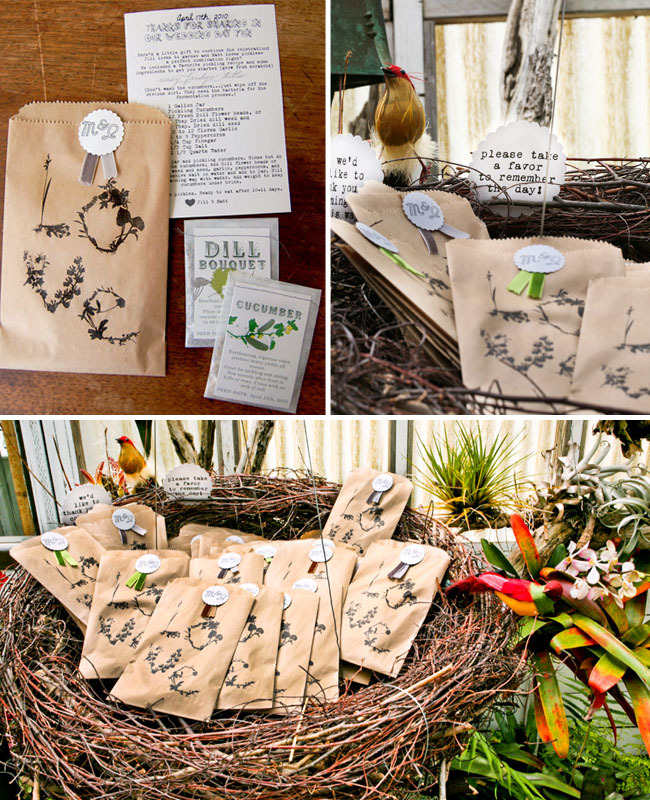 I gocco-printed a bag with orchid silhouettes to form the word LOVE, we packaged dill and cucumber seeds, and made labels that Matt’s mom sewed onto little glassine envelopes. The bags sat in a giant nest for our guests to pick up on their way out. We didn’t feel like the greenhouse was the right setting for a big sit-down meal and we are snackers anyway (I’d rather have a spread of olives, dips, and bites than a big meal), so we asked our amazing caterer to create a seasonal menu of passed appetizers and platters for us. He prepared beautiful bite-size versions of our favorite dinner foods inspired by spaghetti and meatballs, steak and asparagus, grilled cheese and tomato soup, and carnitas tacos. We used a bakery that Matt’s family has been going to for years for all the desserts, and who make his favorite raspberry cream “frogs”. They fit in quite well at the greenhouse with the resident frogs that sing very loudly in the afternoon. There was even a carrot cake that our dogs stood on (created in miniature form by the talented Sian Keegan). Bernie and Pee Wee love carrots. 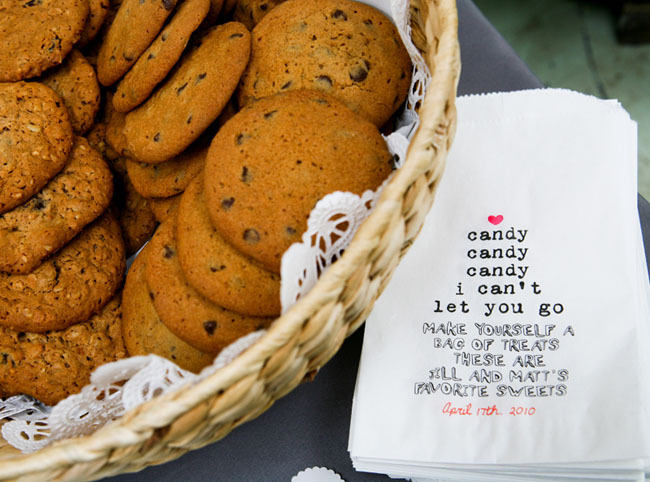 I also printed candy bags for guests to fill up at our treat table with gummies galore, oatmeal raisin cookies, runts + caramel robin eggs. Any advice for those planning now? My advice for those planning their wedding right now is just make it yours. It is really easy to get caught up in all the madness of planning and making everything “look perfect”. There are plenty of ways to include tradition in your day without following a cookie-cutter plan for what a wedding “should be”. It should be whatever you want it to be. You don’t have to be a creative genius to plan a beautiful, personal wedding; there are so many fabulous blogs and websites out there packed with thousands of dreamy and unique photos to help you! 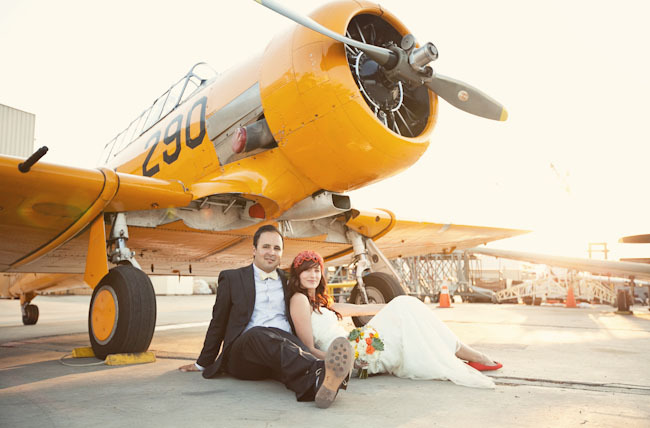 The trick is figuring out how to personalize all the ideas and images you are attracted to for YOUR big day. Thanks you so much Jill. Congrats to you and Matt on your marriage and best wishes to you both! LOVE it! 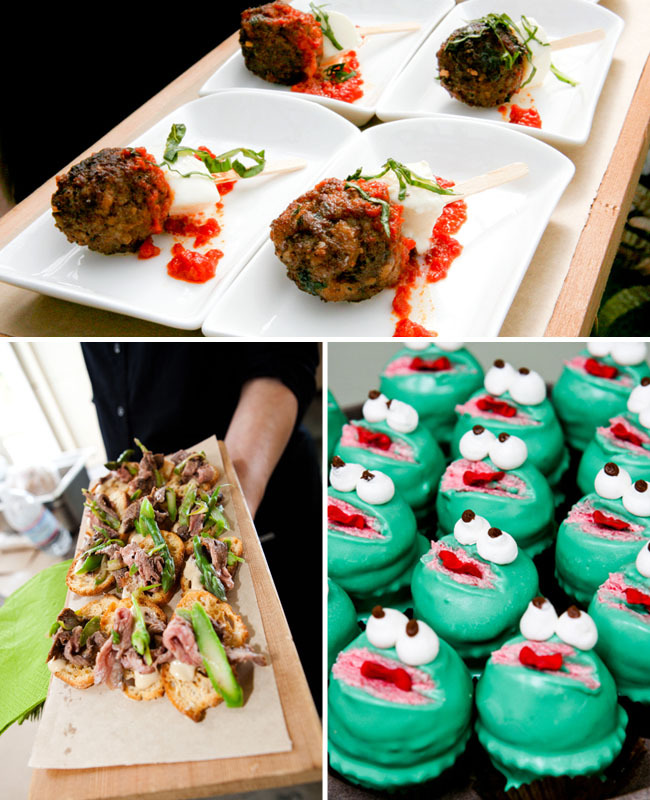 Especially the frog dessert : ) Thanks for sharing. I remember this wedding because I am seriously obsessed with the bride’s outfit…the layered “petals” on the skirt of her dress and the black stockings! My goodness that is so rockin! i am loving the details and decor! love her dress too! 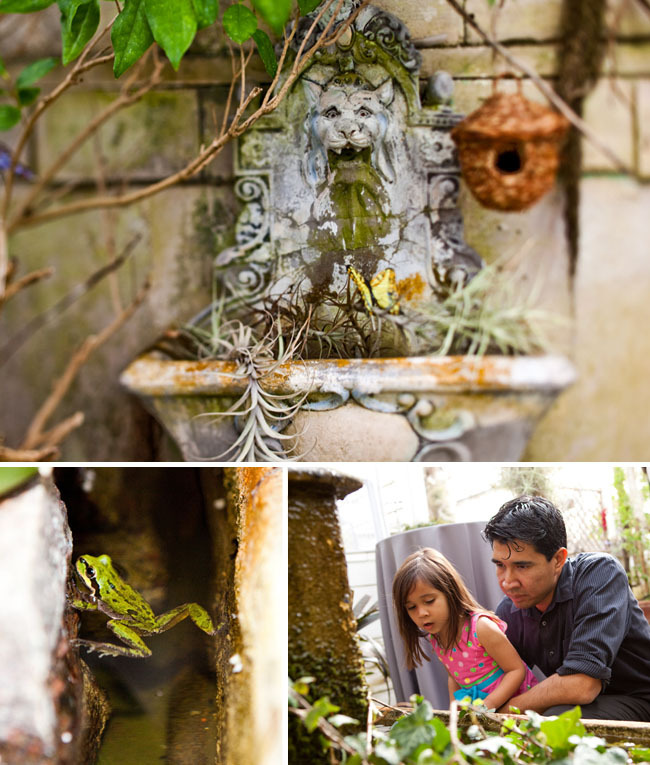 I adore this venue, i want to have a fairy tea party there! 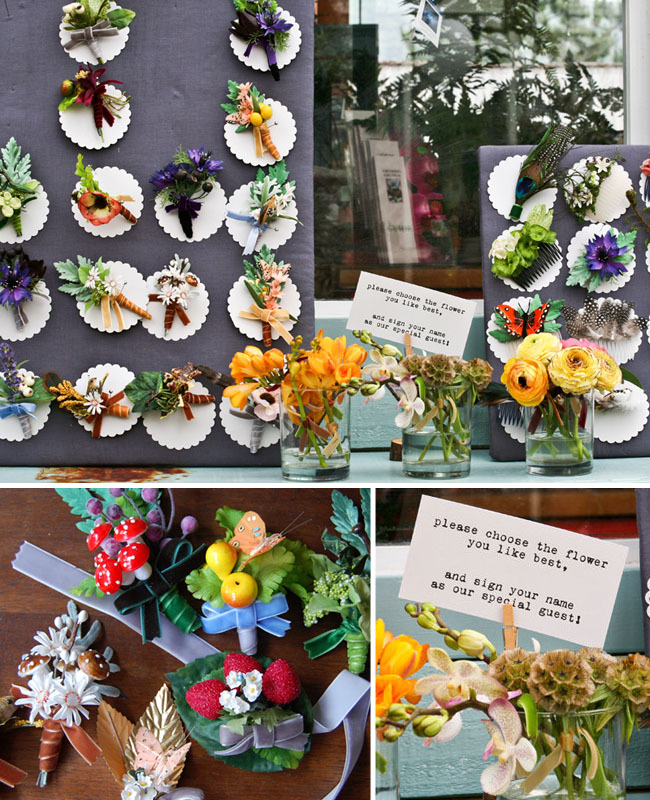 Definitely loving the boutonnieres and hair pieces for guests idea! Just curious about how the invites were sent out? I have always loved greenhouses and this is heaven!! 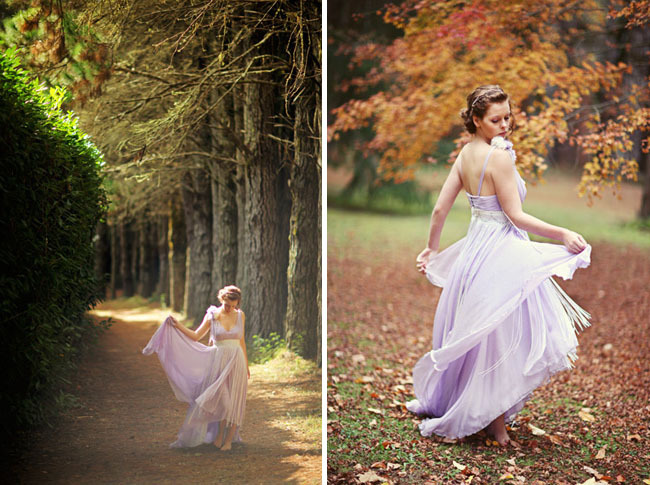 The whole thing looks so enchanted and full of color and life. Congratulations! Love all the details!! 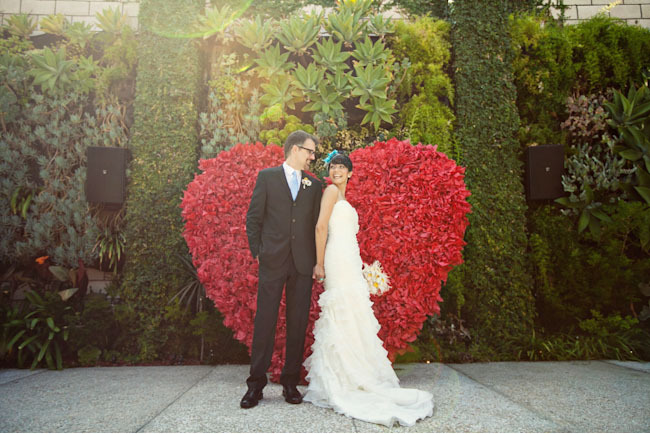 Beautiful wedding – thanks for sharing! the save the dates are fabulous! What a beautiful wedding! And so personalized! I really love flowers, orchids in particular so this was really inspiring. I love the flower bar! 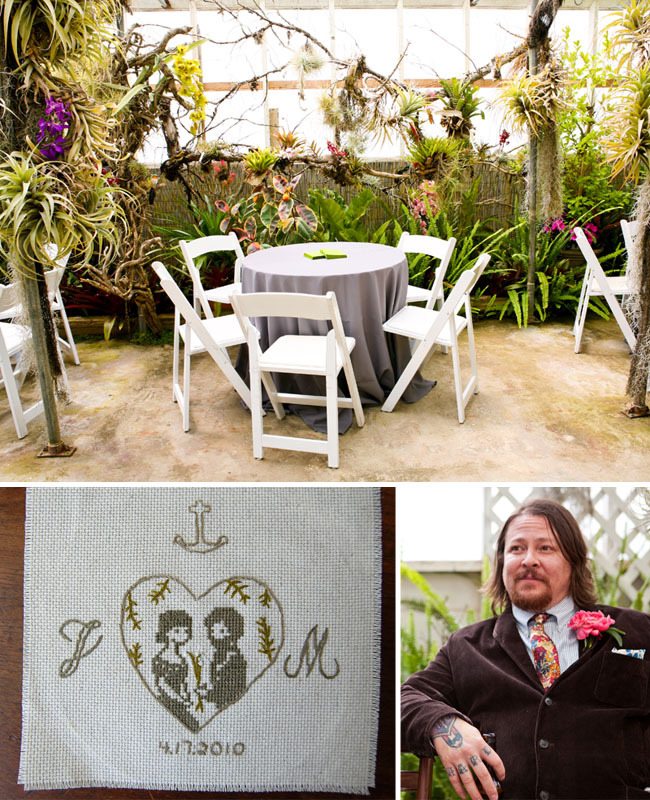 Each of your guests should feel special, and what a more fitting gift in a greenhouse! So tasteful and yet hip at the same time. I loved how you tied your mother and grandmother in your dress. So marvelous. Thumbs up, way up! I LOVE THIS! I love how different and unique it is. I love how creative it is and how they stayed true to who they are. This is what wedding days are all about! PS love that you had your mom and grandmother there in spirit with the charm on your dress. 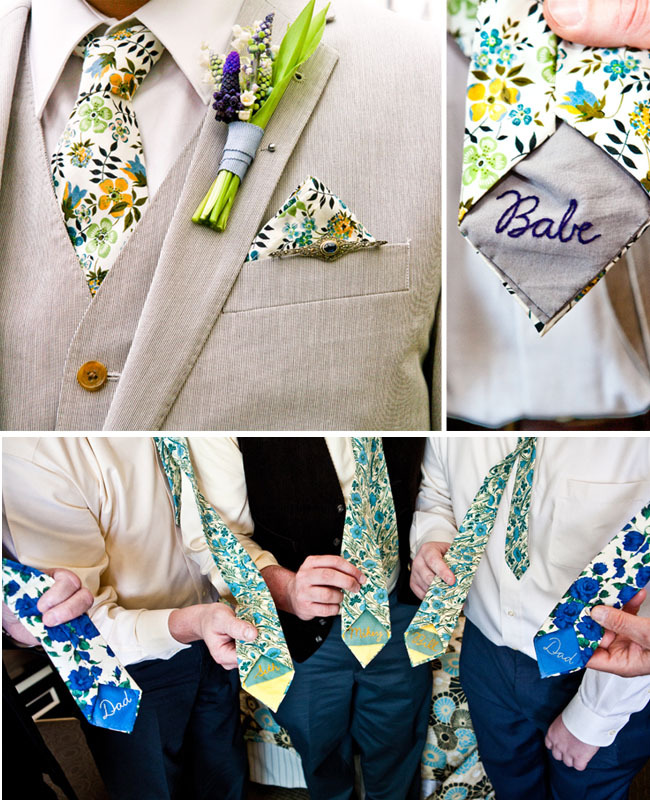 I adore everything about this wedding! 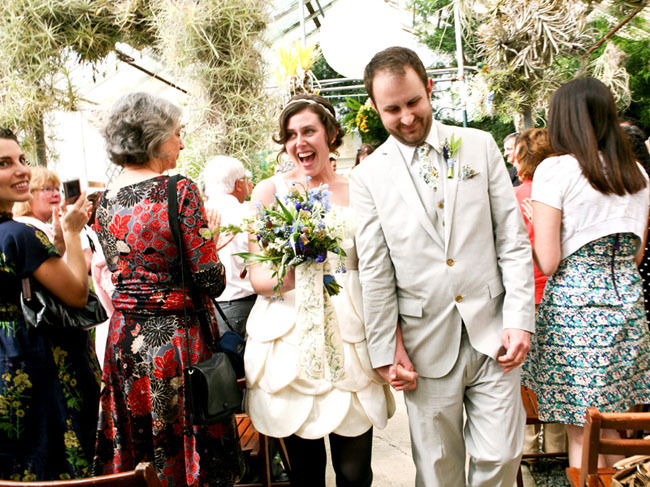 Her dress is so fun, and the ties with the stitching are sweet and quirky! Totally charming! Love all the personal touches and details…the save the dates are so creative. Love it! Two questions: What is “gocco-printing” and where/how do you get glassine envelopes? Holy moly, that dress is unbelievable!! Amazing!! It seems wrong to praise your originality and then steal your ideas but I really, really want to! 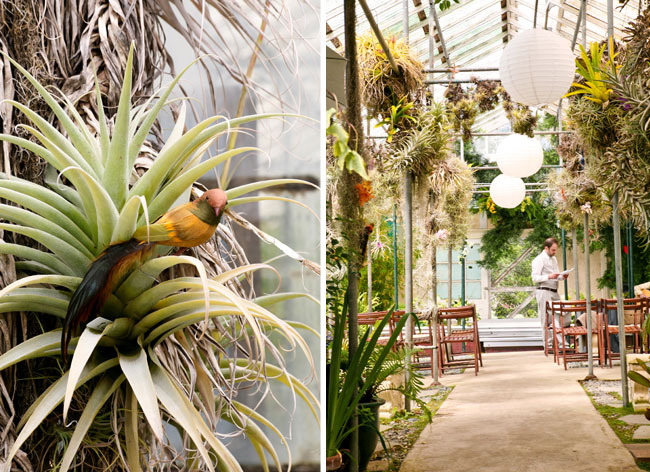 Charming and romantic.Are you sure it is not the fairy tale greenhouse wedding? In love with the invitations. I would love to do that. I stumbled across this post while Googling for greenhouses. BEAUTIFUL wedding!